Our area experiences the full range of severe thunderstorm hazards - from tornadoes to flash flooding to severe thunderstorm wind gusts. Here are some safety ideas for thunderstorm hazards. In addition, Severe Weather Awareness Week is held each spring to review these hazards and promote safety ideas. The Hazardous Weather Outlook includes any potential weather hazard out to seven (7) days. 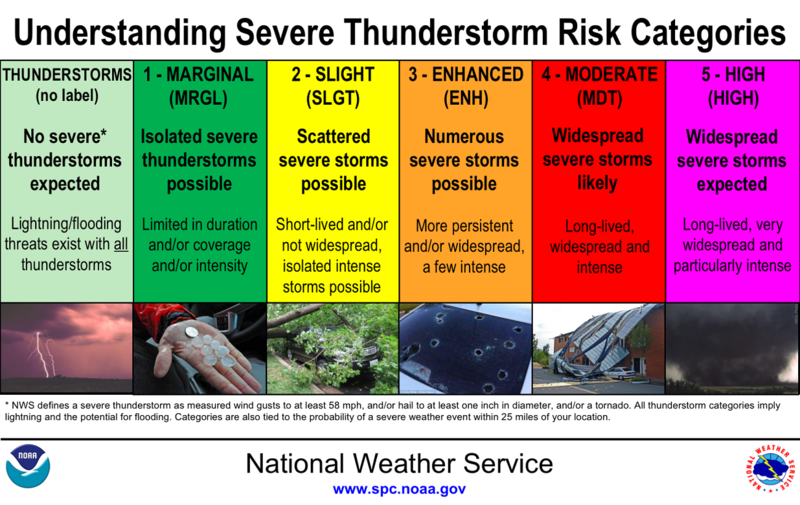 It is used for planning purposes and includes a short description of what the weather threat is, when it is expected, and whether storm spotter activation will be needed. The HWO is issued daily around 5:00 AM, and updated during the day as needed. It is also broadcast on NOAA Weather Radio at the top and bottom of every hour. A Severe Thunderstorm Watch is issued by the Storm Prediction Center (SPC) when there is a potential for severe thunderstorms to form or move into the area. A severe thunderstorm consists of wind gusts of 58 mph or higher, or 1" diameter size hail or larger. Severe Thunderstorms occasionally do produce tornadoes with little advance warning. A Watch is typically in effect for about 6 hours and covers a region of a state. A Flash Flood Watch is issued when the potential for flash flooding exists. Usually these are issued when abundant, heavy rainfall is expected from thunderstorms, especially if the ground is already near saturation. Flash Flood Watches are sometimes issued if there is a possibility of a dam failure as well. A Tornado Watch is issued by the Storm Prediction Center (SPC) when there is potential for severe thunderstorms that can produce tornadoes. Thunderstorms may be more severe and the atmosphere is favorable for rotation within thunderstorms and tornado development. A Watch is typically in effect for about 6 hours and covers a region of a state. A Severe Thunderstorm Warning is issued when a thunderstorm is or is expected to produce wind gusts of 58 mph or higher, or 1" diameter size hail or larger. In this case, either severe weather has been reported or the thunderstorm looks severe based on Doppler Radar. The warning is typically in effect for 30 to 60 minutes and usually covers a county. A Flash Flood Warning is issued when a rapid rise in small creeks and streams is expected. Flash Flooding or mudslides are expected or occuring. The warning is typically in effect for 2 to 3 hours and covers a county. A Tornado Warning is issued when a severe thunderstorm is or is expected to produce a tornado. In this case, either a tornado has been spotted or rotation is being detected within the thunderstorm on Doppler Radar. The warning is typically in effect for 30 to 60 minutes and usually covers a county. Tornado Warnings are issued infrequently and should be taken very seriously. A thunderstorm is defined as severe if it produces damaging wind gusts (58 mph or higher), large hail (one inch or larger in diameter), a tornado, or a combination of these elements. Of course thunderstorms also produce deadly lightning and heavy rains. Most thunderstorms do not become severe, but for the smaller percentage that do - Severe Thunderstorm Warnings are issued. Severe thunderstorms can occur at any time of the year, day or night. The peak season for thunderstorms is from April through September, and during the afternoon or evening hours. The most common type of severe weather is damaging thunderstorm wind, also known as "straight line wind". Strong thunderstorm wind gusts can reach hurricane force and in extreme cases - 100+ mph. Wind damage can be extensive and affect entire counties instead of narrow tracks like tornadoes. Objects like branches, trees, barns, outbuildings, high-profile vehicles, and power lines/poles can be toppled or destroyed, but as wind gusts increase you can have damage to roofs, windows, or homes. 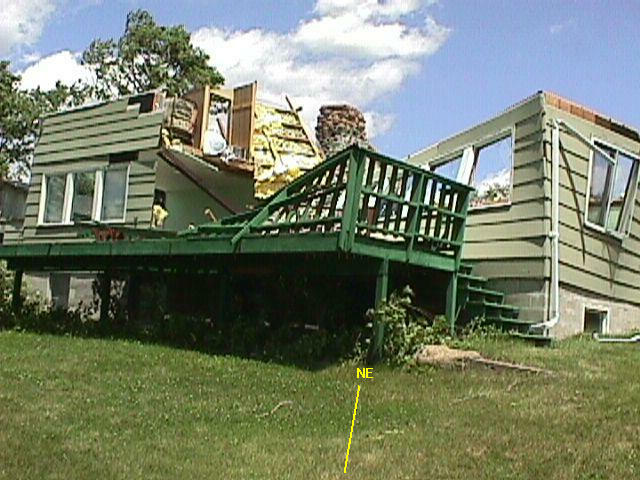 Some extreme examples from June 1998 include entire homes destroyed in Nashua, IA or swaths of flattened trees in western Wisconsin. Large hail is also common and can produce tremendous property damage. Usually large hail does not become life threatening unless people are stuck outdoors without shelter. Hail is considered severe when it reaches the size of a quarter or larger. Baseball size hail fell at the La Crosse NWS office in June 2001. And in April 2011, large hail hit the south side of La Crosse, WI. Move to a sturdy building. If boating or fishing, move to shore. For a full link to Flood Safety, click here. Flash flooding, one of the leading thunderstorm killers, is a rapid rise in small creeks or streams, usually from excessive thunderstorm rains. Flash flooding can also occur with ice jams on rivers or if a dam fails. A mudslide, like what hit Cassville, WI in 2002, can also indicate flash flooding and can be just as dangerous. How bad can flash flooding be? This question was answered in August of 2007 when over a foot of rainfall hit parts of southeast Minnesota and southwest Wisconsin. Flash flooding was significant. There were eight fatalities directly related to the flash flooding (7 of them involved automobiles). Property damage was tremendous and terrain was changed. Even though scientists feel this may have been a 1-in-2000 year flood, lessons learned from this flash flood will not soon be forgotten by those impacted. In 2004, there were two deaths in our area from flooding. One was in Vernon Co., WI when a woman drove into a flash flood late at night - click here to see this summary. The second case was from the river flooding in Austin, MN when days of heavy rain caused the Cedar River to overflow and a 20-year old man tried to cross it on foot. Most people don't respect or understand the force of flowing water. Many automobiles become bouyant in as little as 2 feet of water, and you can lose control of your vehicle in as little as 6 inches. Even pickup trucks or SUVs may begin to float in relatively shallow water given the size of the tire. Most flash flood related deaths occur from people driving into high water. This is especially dangerous at night when people may not see the flooding and simply drive into it. Move to high ground. Avoid flash flood prone areas. Never drive into flood waters. Obey all road closure or high water signs - find an alternative route if needed. Be especially cautious at night when it is more difficult to spot flash flooding. A tornado is a violently rotating column of air in contact with the ground. The peak tornado months are May and June (July is 3rd), but tornadoes can occur any time of year if conditions are right. Peak tornado time is 3:00 to 9:00 PM, but they can occur day or night, and may be hard to spot or wrapped in rain at times. Tornadoes are not always visible and can form with little advance warning. Click here for tornado statistics in the NWS La Crosse area. While larger tornadoes are somewhat rare in the region, we have had several in the last 6 years. An F3 tornado hit the Iowa-Minnesota state line on June 11, 2004. We've had two F2 tornadoes in our area since 1997 include Lewiston, MN (Winona County) in 1999, and Gilman, WI (Taylor County) in 2002. Have a good source of weather information. Consider NOAA Weather Radio. If a tornado or funnel cloud is spotted, or a warning is issued for your county, take action to protect yourself. Move to a sturdy building. Shelters are more safe than mobile homes, especially mobile homes older than 1976. Stay away from windows. Do not try to open or close windows. Stay away from outside doors and garages. Move to a basement and get under something sturdy. If you have no basement, move to the lowest level and get in an interior room, like a bathroom or closet. Put as many walls between you and the storm as possible. Move to a basement or interior hallway on the lowest level. Leave classrooms that have windows or that are on the exterior of the building. Leave large span rooms, like gymnasium or auditoriums. Seek shelter in interior rooms and get under desks or sturdy objects. Be careful in hallways that may act as wind tunnels and funnel debris. Move students off buses and back into the school. Do not let students board buses during a Tornado Warning. Do not try and outrun a tornado. If the tornado is some distance away, drive away from it. If the tornado is relatively close, leave your vehicle for a sturdy building. If no shelter is available, seek refuge in a ditch or culvert. Crouch down and protect your head. Find a shelter if possible. If no shelter is available, seek refuge in a low spot. Crouch down and protect your head. Lightning is also a top killer. On average, 55 people in the U.S. are killed by lightning each year (30-year avg.). Like flash flooding, people do not respect lightning and will often dangerously continue outdoor activities as thunderstorms approach. Lightning is common to all thunderstorms so the threat is always there, with or without a severe weather warning. It only takes one lightning strike to kill or injure. Do not take chances! You do not have to be directly under the storm, or where the heaviest rain is falling to get struck. Lightning strikes can occur many miles away from the parent thunderstorm. If you are near a storm or hear thunder, you are potentially close enough to get struck. For additional Lightning Safety guidelines, click here. Move indoors or to a shelter. A vehicle is more safe than standing outdoors. Avoid standing in an open or high area. Avoid standing near tall objects, or objects that may attract lightning. Avoid standing near objects, like chain link fences or grandstands, that may be struck and carry a charge quite a distance. If caught in the open, move to a safe place as quickly as possible. Staying informed of hazardous and life threatening weather is key to severe weather survival. NOAA Weather Radio is an excellent source of weather information directly from the National Weather Service. Every school should have and monitor a NOAA Weather Radio! To visit our main NOAA Weather Radio page, click here. The National Weather Service in La Crosse currently broadcasts over 10 transmitters. Ever wonder how accurate severe weather warnings are? Click here to review severe weather verification statistics from NWS La Crosse.